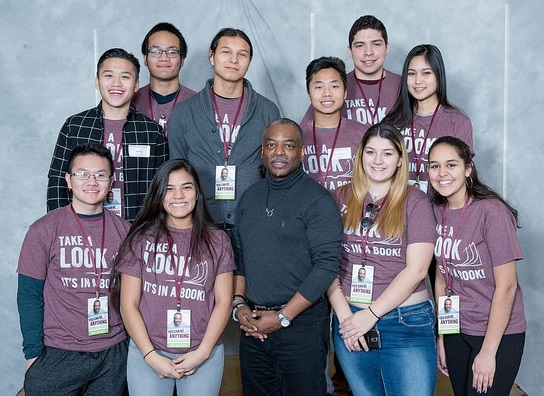 Twin Cities PBS, Wells Fargo, Mall of America, Beckman Coulter, and Lerner Publishing joined forces to present a matinee appearance by actor, director, and educator, LeVar Burton, best known as the host and producer of Reading Rainbow. Scholarship Weekend is an annual event during which bright students from around the country visit campus to compete for Augsburg’s top scholarships. Friday afternoon and Saturday morning, prospective students met with their future classmates and professors, explored labs and classrooms, and got a brief taste of life as an Auggie. In his opening remarks, President Paul Pribbenow thanked the sponsors for making it possible for over 500 high school students to attend a special appearance by Mr. Burton. In addition to attending Burton’s keynote address, sponsor representatives also took part in a special VIP Educator’s Brunch, toured a student research poster show, and learned about Augsburg’s River Semester – the nation’s first ever college semester taught entirely on the Mississippi River. To learn about other sponsorship opportunities at Augsburg College, please contact Jay Peterson, Assistant Director of Corporate and Foundation Relations, at 612 330-1592.